This wonderful combination of cheddarwurst, avocado, and caramelized onion will leave you wanting more! You can make these flavor packed sandwiches in just minutes. I know these sandwiches look weird, and looks like a crazy combination of ingredients and flavors, but it works! 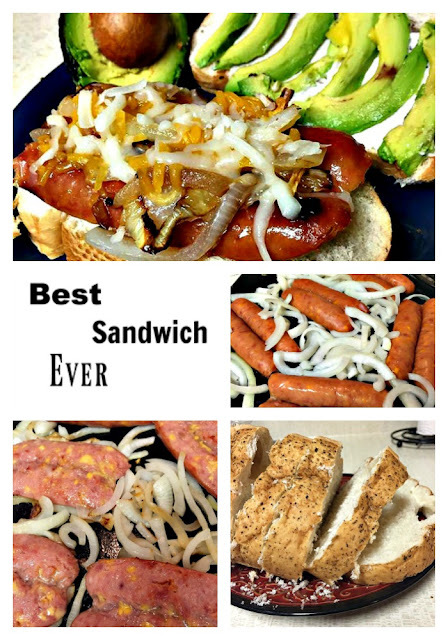 These sandwiches evolved from my hunger, lack of desire to go to the store, and adding some random but favorite flavors we had sitting in our kitchen. One day I was starving, but we didn't have much in our pantry or fridge. I was too hungry to make a grocery store trip, come back, and then cook, so I took what we had and created this sandwich. We now literally have these sandwiches every other week or so and we can't get enough of them! Something that nearly matches my hate for hunger, is my hate for doing the dishes. Out of my hate for doing the dishes, I only used one skillet to cook the cheddarwursts and grill the onions at the same time. This led to the creation of the most delicious carmelized onions I have made! Basically, what I am saying is that my laziness has created this amazing sandwich and you're welcome for being lazy. Hope you enjoy these as much as my wife and I do! Put a skillet on medium heat and spray with cooking spray or grease with butter. Gently slice your cheddarwursts down the middle enough so, so that you can open it but still stays connected as one wurst (as pictured above). Place the cheddarwursts down on the heated skillet and spread the sliced onion around the cheddarwursts (as pictured above). Allow cut onions to soak up fat cooking out of cheddarwursts and caramelize onions. When browned, flip cheddarwursts and onions. Place cheddarwursts on toasted bread, onion on top of of the wurst, and cheese on top of onion. On other side of toasted bread, spread mayo, avocado, and salt. Combine sandwich sides and enjoy!